After years of anticipation, the sequel to J.J. Abrams’ bold new restart of the Star Trek film franchise is finally here. Though it was the eleventh film in the series, as the first film set in this alternate universe, it was also the franchise’s first step in an attempt to grab at a brighter future after years of the franchise taking a dive in both quality and creativity. With the promise of the series shedding years of expectations and established canon with a bit of time travel, 2009’s Star Trek brilliantly maneuvered the series into a position where it could once again surprise new audiences, Trekkies, and Trekkers alike. Perhaps that’s my main complaint with its sequel, then, so let me just get the bad news out of the way: There’s quite a bit of rehashing going on here, which is perhaps the darkest thing about the film. All that promise of originality and the exploration of the unknown is sacrificed in the name too much fan service. 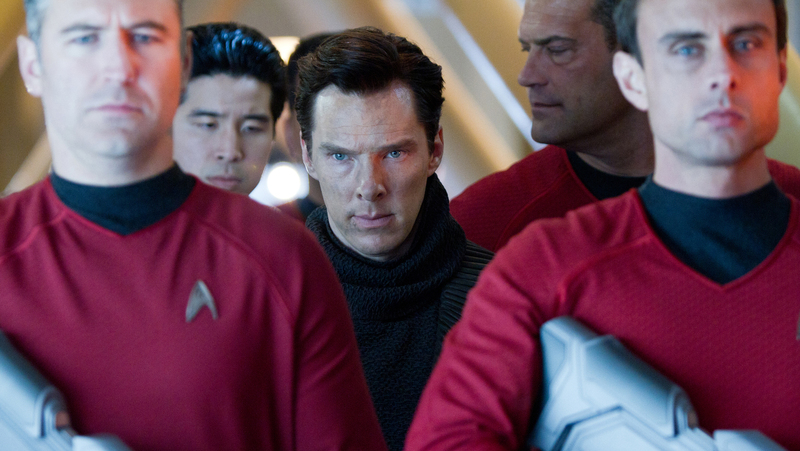 There’s just not enough “boldly [going] where no one has gone before,” and it sometimes gets to the point of pandering. Longtime fans will find more to complain about than those who joined us just four years ago – people who perhaps would call us all a bit nitpicky. Perhaps even Abrams himself, who was very upfront with the fact that he himself was new to the series with the first film. Perhaps he thought he and his writing team were being very clever with all the callbacks they do here. It’s actually a bit too much – often unnecessary or even detrimental, as the film could have easily stood on its own with largely the same plot with just a few tweaks. And yet, while that is a significant complaint, I can honestly say with 100% certainty that Into Darkness is an otherwise quite stellar follow-up to what has become one of my favorite films, if only based on its entertainment value. And Into Darkness, quite simply, is an otherwise outstanding piece of entertainment that overcomes its weaknesses, one that possibly even exceeds the first in all other aspects. The plot is superficially quite simple, but there’s a great deal of suggestion at play, as well, that suggest an even grander universe that has still yet to be fully explored. This bodes well for any future entries, and it’s a perfect means of developing these revamped characters even further as they begin to diverge but continue to echo their prime universe counterparts. 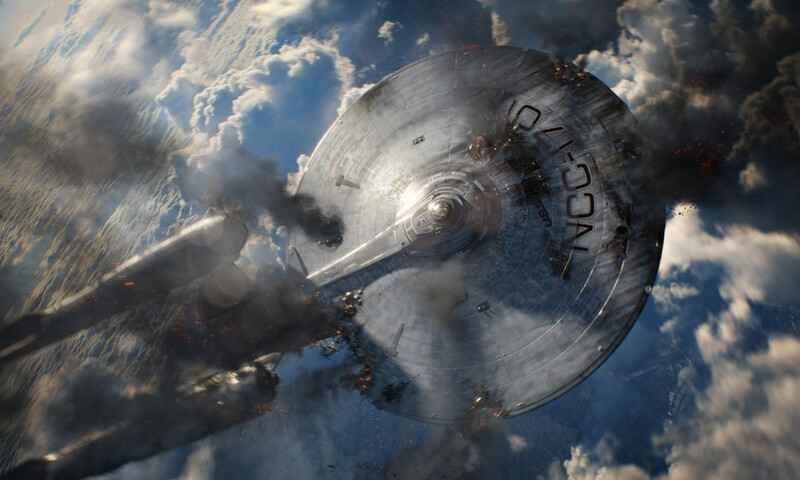 The story revolves around the crew of the Enterprise going after a terrorist named John Harrison, a man who has attacked Starfleet from within and who has recruited others into doing his bidding. It quickly becomes apparent that John has an agenda against Starfleet that seems to be quite personal, and it’s only a matter of time before his calculated attacks become personal for Kirk and his crew, as well. Driven by anger, fear, and a thirst for revenge, their latest mission puts the crew’s orders and morals at odds with one another and not only puts their personal relationships at risk, but also calls into question their loyalty to the very organization responsible for their coming together. There was a running theme throughout the original series films where the crew of the Enterprise frequently and knowingly disobeyed their orders from Starfleet, often with very little on screen reproach for their disobedience. This concept worked well for the original cast, and they even tried carrying this over into the films featuring the decidedly stuffier cast of The Next Generation. 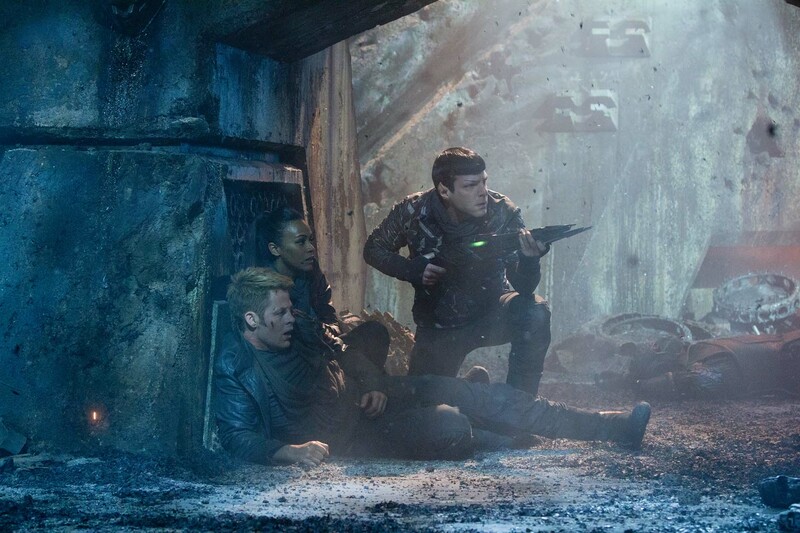 With Into Darkness, however, the question of knowing when to accept one’s orders and when to compromise in the name of what is right this takes center stage, often through the contrasting personalities of the impulsive Kirk and the very logical first officer Spock. Of course, logic dictates that sometimes compromise, both in terms of seeing eye-to-eye with someone you disagree with and in terms of doing what is expected of you, is sometimes the only necessary course of action when what is right is clear from all perspectives. 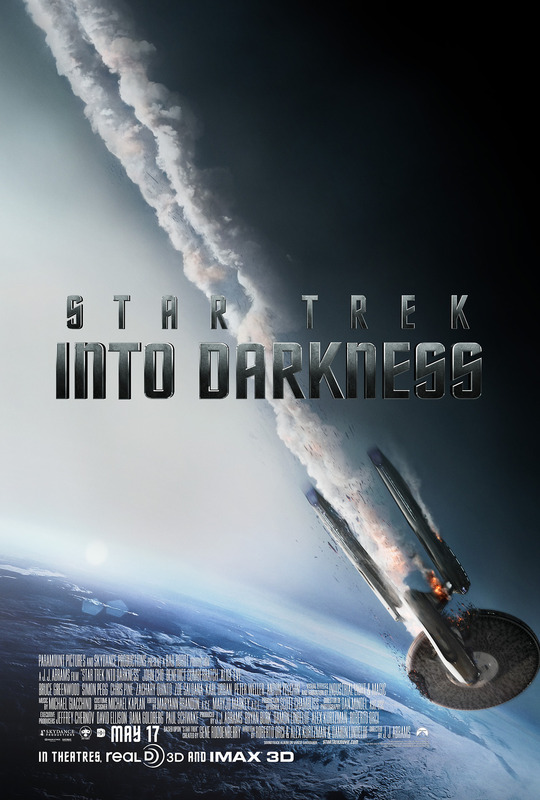 Into Darkness weaves this into its story nicely, but it would be nothing if not for the actors, all of whom step up their game for their first return to the series in four years. Despite this long real-world gap, the cast has already come to know the characters so well and work off one another very well. Smaller supporting cast members like John Cho’s Sulu and Anthon Yelchin’s Chekov continue to get their moments in the spotlight, while newcomer Alice Eve, playing the new chief science officer aboard the Enterprise, is a fine addition to the admittedly packed cast. Zoe Saldaña and Simon Pegg get far more to do here than in the last outing as Uhura and Scotty, respectively, both in terms of fun character moments, such as Uhura’s encounter with a beloved alien race and Scotty’s lighthearted humor amidst the several action scenes. 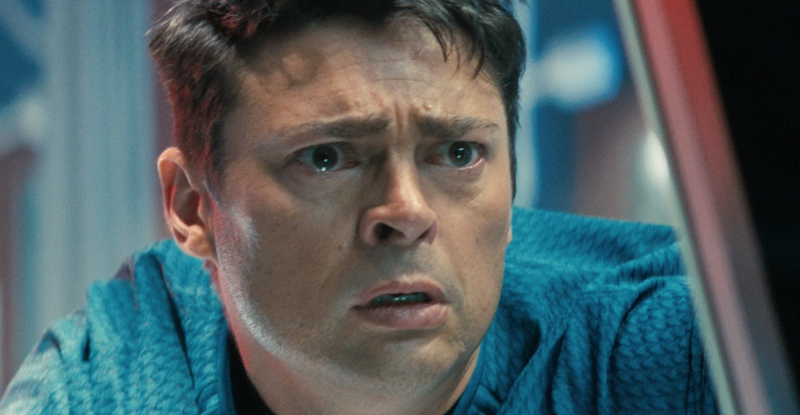 And Karl Urban continues to revel in his role as the curmudgeonly Dr. McCoy. Much was made of Benedict Cumberbatch’s casting as the film’s villain, a role he inherited from the formerly cast Benicio Del Toro, though I can honestly say I had never actually seen anything the man has done that I could remember outside my recent viewing of Atonement. Whether or not you’re a fan of any of his previous work, however, will likely not influence your opinion of his performance here. Me? I found his particular brand of Shakespearean scene-chewing quite marvelous and intimidating. The eloquent John Harrison more than makes up for the rather dull Nero in the previous film with his grandiose speeches and striking facial features and movements. The performances I was most impressed with, however, were that of Zachary Quinto and Chris Pine – Pine in particular. Quinto was always perfectly cast in the role and nicely brings out the soulful qualities in a character who is all too often falsely characterized as being devoid of any sort of emotion at all. Quinto’s Spock, like Nimoy’s, suggests all the emotion going on within and the internal conflict of either choosing not to express this emotion as a Vulcan would or letting it all out as a Human would. But, again, it’s Pine who I was the most impressed with. 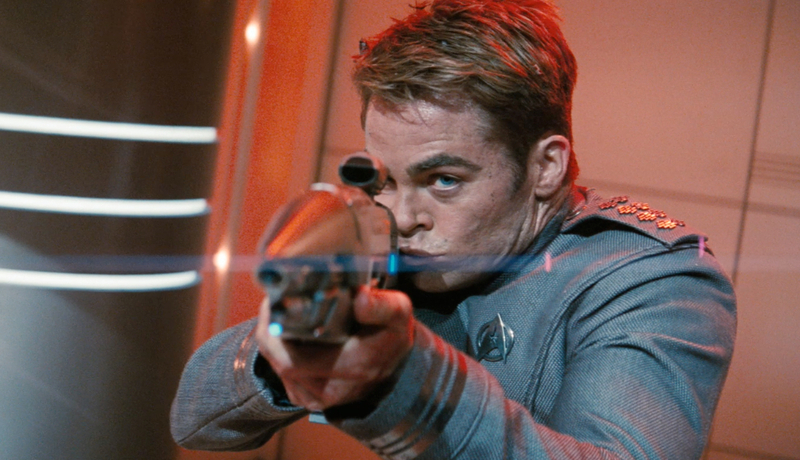 As the still rather young James T. Kirk, Pine continues to play Kirk as an arrogant SOB, someone who believes that regulations should often take a backseat to feelings, but he’s also extraordinary at showing us just how far Kirk has come since the days when he was hitting on girls and getting hit by the guys watching over them, and many of the film’s pivotal and emotionally moving moments hinge upon Pine’s natural talents and his ability to humanize this legendary character. If you found the film’s opener to be too lacking in the waterworks compared to its predecessor, prepare to find yourself moved on a more regular basis throughout the film. In fact, that’s something that the film does even better than its predecessor: spreading out the humor, the action, the exposition, and the drama far more evenly over the course of its runtime, creating one satisfyingly smooth yet nuanced concoction. Though I’ve admittedly only seen the film once so far and am still likely still riding the hype train in my mind, I can’t think of one moment where the film felt like it was becoming dull or spinning its wheels, even when it was misfiring with its moments of forced nostalgia. Into Darkness is just one of those films where the interpersonal relationships and dialogue are just as intriguing as the acrobatics and elaborate action sequences. I honestly can’t complain… at least, not too much.